After enduring harsh criticism after the United States failed to score against France and suffered its fourth loss during his reign, Jurgen Klinsmann decided to make some tactical changes. Rather than playing the 4-1-3-1-1 that he has preferred over the opening matches of his tenure, Klinsmann elected to play a second striker to support Jozy Altidore and results were immediately seen. In his first starting CAP for the United States, midfielder Fabian Johnson’s first minute shot set the tone for the USA and the positive attacking performance continued through the first half. After Johnson’s opening effort on goal, the USA was immediately forced onto the back foot due to an excellent counter-attack from Slovenia and left-back Timmy Chandler playing Slovenian striker Zlatan Ljubijankic onside. Carlos Bocanegra shepherded the ball out for a corner and the crisis was averted. Open play resumed with the USA pressuring Slovenia up the field with their attackers and playing a high defensive line. Klinsmann’s decision to increase the pressure was rewarded in the 9th minute when Clint Dempsey forced a turnover just outside the Slovenian penalty area, and Edson Buddle fired a 25 yard shot into the goal off the left post. The good fortune did not immediately continue for the United States, as Slovenia settled into the game they enjoyed their share of opportunities on goal. Slovenia was rewarded for their efforts when Ljubijankic caught defender Clarence Goodson out of position and played a through ball to Tim Matavz who equalized. This 26th minute equalizer came after Slovenia was repeatedly caught offside by Klinsmann’s high defensive line. Attempts were missed by both sides as the game approached the 40th minute when Slovenia conceded a corner to the USA. On the ensuing corner, Michael Bradley launched a perfectly placed corner to the head of Clint Dempsey, who broke free of his defender and put the USA on top once again. This was a return to the well-executed set pieces that American soccer fans have come to enjoy from their national team. Fabian Johnson’s impact on the USMNT squad was immediately felt in this match and continued throughout his time on the field. In the 42nd minute, Johnson received a pass on the edge of the penalty area and made a turn in on goal before being hacked down by Slovenian defender Miso Brecko. The referee pointed to the penalty spot and Jozy Altidore stepped up to take the kick and smashed it into the back of the net. The 43th minute penalty gave the United States a 3-1 lead heading into the halftime break. Unfortunately for American soccer fans, the second half was not the comfortable affair some had envisioned. Slovenia began the half after making two substitutions and immediately began to take the game to the Americans. Tim Matavz began the second half with a magnificent solo run through the United States defense before having his shot blocked by a sliding Carlos Bocanegra. This continued throughout the second half as the United States defense looked disorganized and were frequently scrambling to clear the ball from danger. Slovenia was extremely unlucky not to score in the 60th minute when a headed corner went off the crossbar and several shots were blocked by Tim Howard and defenders before the ball could be cleared to the wing. The danger was not over though as the ball was played back in which forced Tim Howard to punch. The ball again bounced back to Slovenia and found Tim Matavz who turned and struck a shot off of Howard’s left post. The ball was again not cleared well enough to keep Slovenia from attacking again. This time when Matavz was given the opportunity he did not miss, firing a shot low and hard past Tim Howard and into the goal. The game then slowed down considerably, with the United States controlling more possession, but that did not save them from a scare in the closing minutes of the game when a free kick was conceded within shooting distance from Tim Howard’s goal. However, the attempt was wasted and the United States survived the second half barrage from Slovenia to escape from the Petrol Arena with a victory. 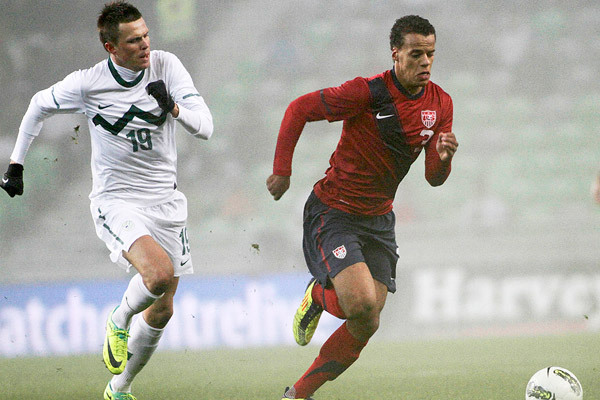 Overall the USA looked like a more lively side with two attackers up front. It gave them more attacking options and the team responded very well after Slovenia equalized their early goal. Timmy Chandler looked dangerous making attacking runs, but was caught out of position defensively several times, which is something that can be expected from a young defender. Michael Bradley was very effective in his return to the USMNT squad; he completed the most passes for the United States and made his presence felt throughout the match. Kyle Beckerman brings his extremely high work rate into the US squad, but continues to offer little else to it. For a player that Klinsmann has identified as important to the squad, his continued foibles may end up being a detriment to the squad as a whole. Clarence Goodson’s performances continue to fall short of what has to be expected from an American center back. His errors have caused the United States to concede in consecutive matches, and these errors cannot be accepted from a 29 year old center back. Klinsmann’s tactical change to a 4-4-2 saw an immediate reward for their positive play with the victory. By giving the strikers orders to pressure the defense at all times, it takes advantage of the USA’s superior fitness levels and gives opponents less time to consider their attacking moves. Improvements must be made in the back four, as they are lacking a definitive choice for a center-back to join Carlos Bocanegra. Timmy Chandler’s errors will be corrected as he improves with experience, but the squad really looked like it was missing Oguchi Onyewu at times. American fans came into this international break looking for a victory in Europe and got one, hopefully Klinsmann can keep the team moving in this positive direction.